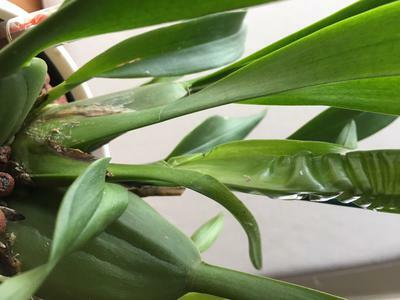 I purchased one of your hydroponic "Starter Sets", and thanks to the helpful instructions, was able to transplant my Oncidium orchid without a problem. But now now that some months have passed, some of the leaves have pleated and dark brown areas are appearing where the leaves meet the pseudobulbs. Based on information I found on the Internet, I understand that pleated leaves are a sign of insufficient water? I have over-watered plants in the past so I'm likely erring on the side of too little water. I will pay more attention to the water gauge. Are the dark areas that can be seen in the attached photo indicative of insufficient water too? "Accordion leaves" are the result of uneven watering - not under watering. This happens more frequently with plants growing in traditional media because watering can be a guessing game. The water gauge on our pots should be helpful with this. I like to establish a definite wet/dry cycle with my orchids. I water to 1/4 - 1/2 on gauge and then wait until system is completely dry before rewatering - which is usually 2 weeks. (I use the water gauge as a handle to lift inner pot to see if the bottom is dry - which is several days after the gauge reads empty. 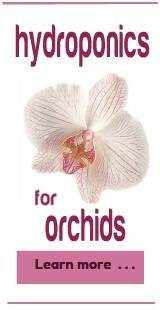 Keep in mind that with orchids, watering can vary with the seasons. When the plants are actively growing in the summer they drink more water than in winter - sometimes 2-3 times more! Once you get a rhythm established watering will be easy - and you won't need to be as careful. I wouldn't be too concerned about the "dark areas". They don't have any relation to watering. If anything, they would be a signal that your plant needs more light. Join in and write your own page! It's easy to do. How? Simply click here to return to Questions on Repotting Soil Plants to Hydroponics.